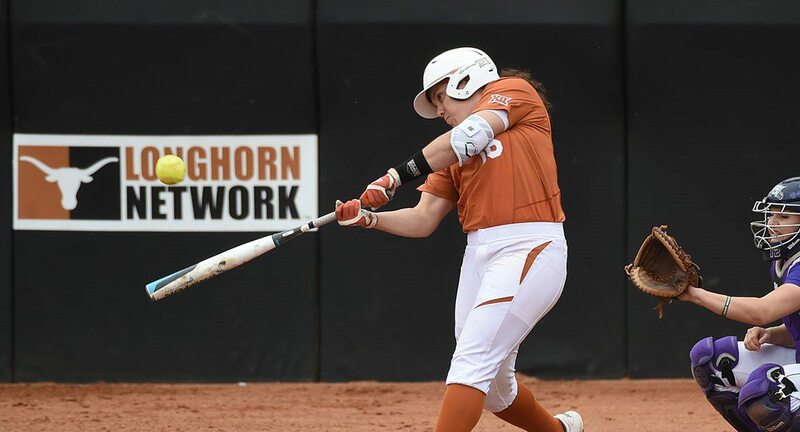 Sophomore outfielder Bekah Alcozer jump-started the Texas softball team's offense with a three-run double in the first inning of Wednesday's 12-3 win over St. Edward's (photo courtesy of texassports.com). AUSTIN, Texas — The University of Texas softball team opened its fall season by pounding out 12 hits and batting around in each of the first two innings en route to a 12-3 win Wednesday over St. Edward’s at Red & Charline McCombs Field. The Longhorns got their 12 hits from 12 different players, including sophomore outfielder Bekah Alcozer, who drove in three runs with a bases-loaded double in the first inning, and sophomore infielder Christina Bardwell, who hit a two-run home run in the third. The Longhorns got considerable contributions from several freshmen playing in their first collegiate game: shortstop Jade Gortarez was 2-for-2, scoring one run and driving in another, outfielder Tuesday DerMargosian was 2-for-2 and infielder Kaitlyn Slack and first baseman/outfielder Kaitlyn Washington each recorded her first college hit. Senior pitcher Tiarra Davis allowed four hits and three unearned runs while striking out two over three innings before giving way to junior Paige von Sprecken, who allowed just one hit, walked one and struck out two in four innings. The Longhorns return to action at 5 p.m., Oct. 21 when they host Temple College.